Okay – it’s that time of year again. 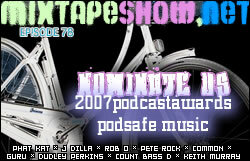 The Mixtape Show is up for nomination in the Podsafe Music category at the Podcast Awards. While you listen to the show, pharm please take 30 seconds out of your day to nominate the Mixtape Show hip-hop podcast for this year’s awards. Step 2: Scroll down and fill out the Podsafe Music box (third box from the bottom on the left). Step 3: Fill in your name, abortion email (they won’t spam you – it’s just to make sure we don’t cheat) and any comments. Step 5. Ask three friends to do the same! Phat Kat – Cold Steel feat Elzhi (prod. J Dilla). I swear I don’t know where that “Blue Steel” slip came from. This came in on wax forever ago and I never quite got around to spinning it – until this morning. Haven’t had any Phat Kat on the show for a while. myspace.com/phatkatakaronniecash. Rob O – Mention Me feat Meccalicious (prod. Pete Rock). Official story from the kids at Foundation is that this was recorded back in the mid 90s, heart and just recently resurfaced. I don’t know what this says about rap music, but anyway it’s a nice cut. Guru - State of Clarity feat Common. Off the upcoming Jazzmatazz Volume 4 The Hip Hop Jazz Messenger: Back to the Future. Does the sample on this one remind anybody else of Taxi? myspace.com/guru7grand. Bonus Track – Keith Murray – Nobody Does It Better. This treads dangerously close to the R&B line, but the angry, bitter ranting coupled with the smooth crooning makes this one a winner. myspace.com/keithmurray. So there’s this week’s joint. As always, check us out on Facebook, myspace, and make sure to vote for the mixtape show in the podsafe music section – the bigger this thing gets, the more music, giveaways, and videos we can get out to you all. Make sure your friends know – myspace bulletins, facebook messages, whatever! get at me.